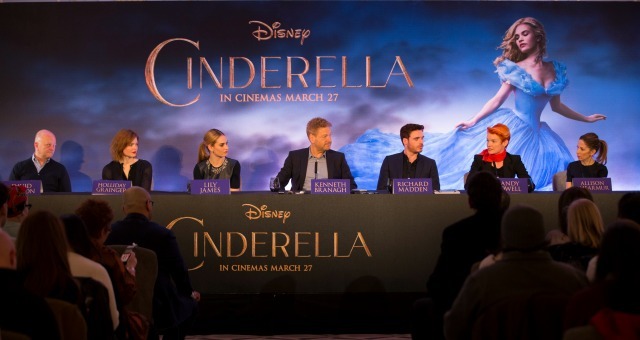 Lined up in befittingly regal fashion, the stars of Sir Kenneth Branagh’s wonderful adaptation of The Mouse House’s Cinderella turned out in a swanky London hotel to discuss the latest in a slew of Classic Disney animations to be given the live-action treatment. Kicking off proceedings was the feted knighted director, talking about his intention to make a film for everyone; from those who wanted to know “Is Gus Gus in the movie?” to “how many parents are going to die?” The wide array of interest upon the announcement that he was going to direct this oft-told tale, made him believe that he could appease all. Richard Madden, no stranger to fantastical tales in medieval lands thanks to Game of Thrones, was next up to shed light on some of the films strongest scenes, those he shares with his on-screen father, Derek Jacobi; hinting at the surprising use of improv between the two actors. 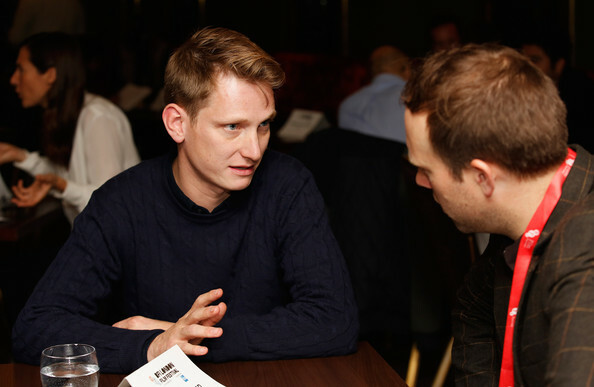 The most resonant comment came from producer, David Barron, who knows a thing or two about successfully transferring source material onto the big screen from his involvement with the Harry Potter franchise, who described his initial reaction to being told Disney had been in touch about a live-action Cinderella, as an awkward “mmmmnn…interesting”. “How do we do something where she doesn’t have a sword in her hand but is suitable for a contemporary audience?” Nobody wanted a subversion of the fairy story a la Snow White and the Huntsman, but a straight up re-telling seemed unnecessary, which is why the success of the final film is such a welcome surprise. Lily James beamed brighter than she does on-screen as she joked of sharing all of the same qualities that her character possesses, but was given short shrift in terms of any in-depth questions. The press scrum then fired off their questions, including one from a young viewer asking whether Richard Madden “felt shy in his trousers?”, and another tackling the issues that the movie has raised about body-image, due to Cinderella’s tiny waist, which to be completely honest was unnoticeable throughout the movie, and addressed by costume designer, Sandy Powell, with a straight-forward rebuttal about how the dress is an optical illusion to down to the width of the skirt, and by producer, Allison Shearmur, as people “paying attention to something that is the opposite theme of the movie, which is your sense of beauty and your strength is what’s on the inside”. Thankfully things moved on to cover the evolution of the Disney princess and as Branagh put it, their “pro-active empowerment”, the director’s obsession with theatrical fantasy films that feature protagonists with beautiful blonde hair after Thor, before events descended into a giggle-fest about the absence of singing in the film, and the choreography involved in trying to rehearse the ballroom dance sequence with the hindrance of that huge dress. All in all, a happy ending.